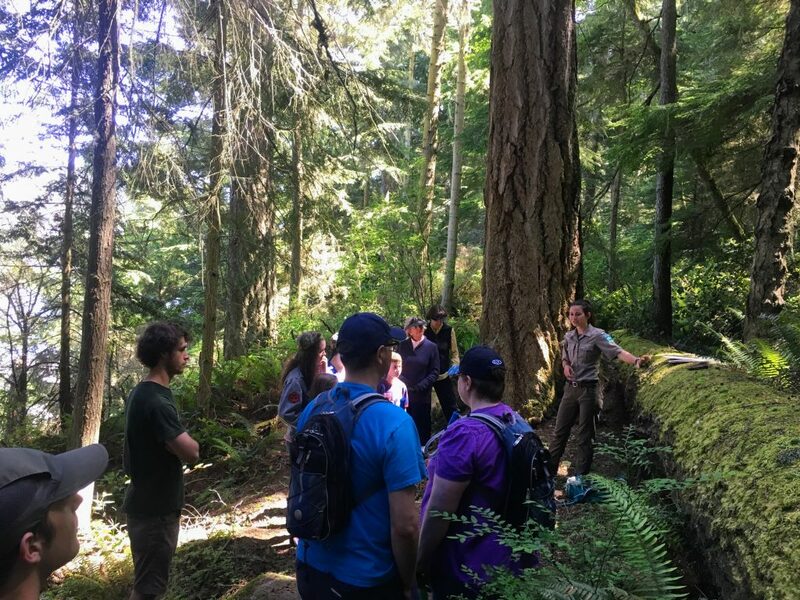 Montana Napier leading a guided hike at Deception Pass State Park. From Memorial Day Weekend until August, our AmeriCorps Park Interpreters led guided Nature Hikes every Saturday at 11am. As a group, we explore the natural and cultural features of the Park through a .6 mile trail to North Beach. Along the way, you walk through a forested shoreline, across shrubby wetland, past ancient trees and a glacial erratic, ending at a beach ecosystem with sweeping views of the Deception Pass Bridge. See a Sitka spruce tree over 500 years old and a Douglas fir tree so big you can shake hands with its bark. The hike is an hour long and open to all ages. However, be mindful that the trail is rocky and root-y and requires careful steps. Once at the beach, you can walk back with the AmeriCorps member at low tide, or continue to explore on your own. Distance: .6 miles one way. Requirement: mindful footwork and a smile! Attendance cost: FREE thanks to your donations to the Deception Pass Park Foundation.